(IR) Masatoshi Kumagai talks about GMO Internet Group Strategy in 2011 Overview of the group's current position and outline of strategy going forward. Our technical and marketing power is supported by a formidable organizational strength. We are a group of over 2,000 Internet professionals. - Internet for Everyone has been our corporate slogan ever since we launched Internet business operations. 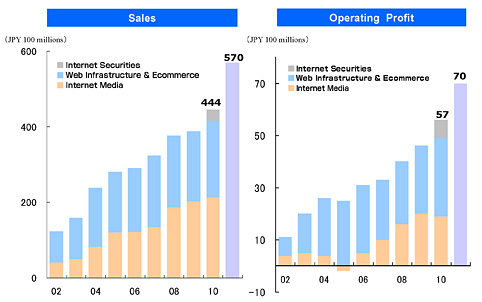 - In August 1999 we became one of the first Internet companies to execute an IPO in Japan. Today we are a comprehensive Internet group operating in four business segments. - If you were to summarize in one sentence our business activities over the past twelve years you could say that we are the company who has most increased the number of websites in Japan, or the volume of information available over the Internet in Japan. - The following diagram illustrates our four business segments. - The Web Infrastructure & Ecommerce business, functions as a one-stop provider of everything required to communicate over the Internet for both businesses and individuals. - The Internet Media segment provides online marketing solutions, and operates a number of online media properties to which advertising is distributed. - The Internet Securities segment offers low-cost, easy-to-use online securities trading services. - The Social Media & Smartphone Platform was formed in 2011 with the objective of boosting group profits through the reinvestment of cash flow, technology and marketing expertise into growth fields. Point program, GMO TokuToku Point links the four segments and promotes synergy throughout the group. 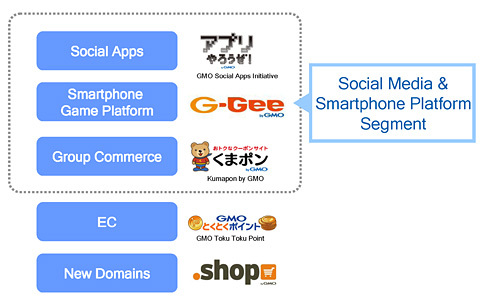 GMO Internet Group is the only group of its kind in Japan that develops and markets Internet solutions using its own technology. - We have four major strengths. (1)The advanced technical resources that allow us to build almost all of our services from scratch. (2)The sales and marketing power right throughout the group to sell the products and services we develop. (3)A level of customer support recognized as an industry benchmark. - An analyst report once stated that we were an organization made of steel. I would say that our greatest asset is the formidable organization that supports all of the above. - When we talk about being the entity that has most increased the volume of websites on the Internet, this is the business segment that has done it. - In this segment there are five services that stand out for the significant market shares they hold. - .com and .co.jp are examples of domains. A domain is an address on the Internet. 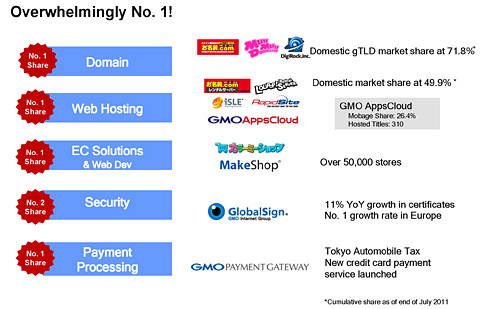 We are the leading domain registrar in Japan. - We are overwhelmingly number one in Japan, and are consistently ranked in the top 10 fastest growing registrars worldwide. - Our web hosting business is committed to responding to growing sophistication and diversification of client needs, through shared, dedicated and increasingly cloud based hosting solutions. In addition, the highly successful GMO AppsCloud specifically addresses the hosting requirements of social app providers. We are the leading web hosting service provider in Japan. In this field we are also overwhelmingly number one. - We provide simple ecommerce site building tools. Unlike online shopping malls Yahoo! and Rakuten, we provide operational solutions for online stores. - Our solutions are convenient and cost-effective, and with over 50,000 stores we have the most widely used ecommerce service offering in Japan. - The Secure Sockets Layer (SSL) (and Transport Layer Security (TLS)) is the most widely deployed security protocol used today. It is essentially a protocol that provides a secure channel between two machines operating over the Internet or an internal network. In today’s Internet focused world, we typically see SSL in use when a web browser needs to securely connect to a web server over the insecure Internet and therefore SSL is essential in ecommerce businesses. - We hold the second largest domestic market share, and according to a Netcraft study (July 2011) we are the 4th largest SSL provider worldwide. - We provide payment processing services for the sale of products via the Internet. When users provide their credit card numbers to our customers we check the credit limit and process the payment. - This is a Payment Gateway Inc. (Tokyo Stock Exchange, First Section: 3769) service. - Our cumulative market share in Japan is 15% (*1). This is another business area in which we hold the number one market share. - As long as the ecommerce market grows and the number of transactions continues to increase our earnings will also increase. - Over the past few years web sites have come to be recognized as assets. In October 2008 we entered the web site brokerage market with the acquisition of Japan’s number one web site brokerage business. - This acquisition further enhances our one-stop service and our line up now ranges from domain acquisition (entry point) to web site sale (exit point). - Overall the Web Infrastructure & Ecommerce segment is overwhelmingly number one in its field. Despite being in competition with major carrier businesses, our domain registration and web hosting businesses boast leading market share, customer satisfaction, revenue and profit. - Each of the Web Infrastructure & Ecommerce businesses have large customer bases. Building an economy of scale grows our operating profit margins. The operating profit margin on each of our products and services is 25%-30%. - The Web Infrastructure & Ecommerce segment has five exceptional features. Once a customer signs a contract we have a continuing source of income creating a stable income business. The Internet industry will continue to exist indefinitely. Take the example of the automobile industry. People get a new car about once every four years. However, even when cars change, the need for roads, traffic lights, parking lots, toll booths and other infrastructure remains. Imagine websites as the cars, ISP services as the roads, domains as the traffic signals, rental servers as the parking lots and payment processing as the toll booths. As long as the Internet continues to exist so will our business. Changing web or mail servers is a tiresome task that users rarely undertake. Customer URLs and e-mail addresses are printed on the business cards they hand out every day. These are services that they don't stop using. The structure of our product and service range is such that there is a natural appeal among products and services. A customer who purchases a domain name cannot do anything with it unless they have a server. Approximately 15% (*1) of customers who use rental servers are using them for e-commerce purposes. Those users will then go on to use payment processing, security and shopping cart services. A certain percentage of those customers will also be interested in advertising support services. - The infrastructure business is (1) stable (2) permanent and (3) a high margin business with a large market share. It is a price leader that continues to grow. One of the leading media properties in Japan. - We advanced into a second business area directly after being listed on JASDAQ on August 27, 1999. To build synergy and to succeed. - There are two reasons why we are in the Internet media business. Customers who start up ecommerce businesses need advertising in order to increase sales. By providing search ranking services, SEO, SEM and other tools we achieve better customer satisfaction, capture more customers (cross sell) and achieve a higher profit ratio. We have a long term plan we call the 55-year plan. We plan to create an Internet group that by 2051 consists of 207 companies that are valuable to society and its people. In the Internet industry, the companies that succeed are the companies that can attract customers. Having our own media that attracts customers gives us an advantage over our competitors in virtually any market we enter. - The Internet Media segment can be roughly divided into two businesses; the business of media “creation” and the business of media “sales”. - Media sales are handled by the publicly listed company GMO AD Partners Inc. (JASDAQ Growth: 4784),GMO NIKKO,Inc. 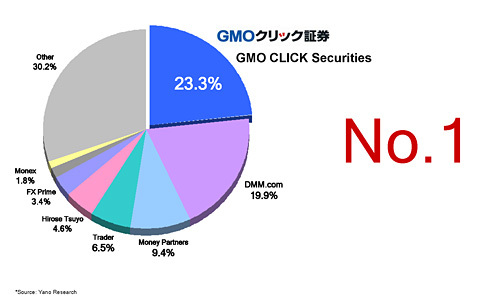 and GMO Internet Inc. (Tokyo Stock Exchange. First Section: 9449). - We have the advanced technology to develop services used by millions of people, the marketing force to attract large numbers of Internet users and the stable operational capability to give tens of millions of users an enjoyable Internet experience. These are our three strengths. - Internet securities trading company GMO CLICK Securities, Inc. joined the group in October 2010. The Internet securities segment complements our existing Web Infrastructure & Ecommerce and Internet Media businesses and helps to further generate synergy throughout the group. We aim to build a group that will suceed for hundreds of years and this is part of the reason why we brought this business into the group. Market leading strategy a mark of group DNA. - With the growth of the Internet and the expansion of broadband usage during the late 1990s, as well as the 1999 relaxation of regulations controlling trading commissions in Japan, online securities services became an essential tool for retails investors. - Providing new technologies, greater value, and innovative concepts through solutions that are universally user-friendly is core to the group's fundamental mission. - Our ultimate aim in this segment is to provide an easy to use online securities trading service to all of our customers. - Despite being late to market, our Internet securities business has grown rapidly to become one of the major players, driving growth in the industry. - In June 2011, we achieved the highest growth in new FX accounts and the second highest transaction volume in the FX market. 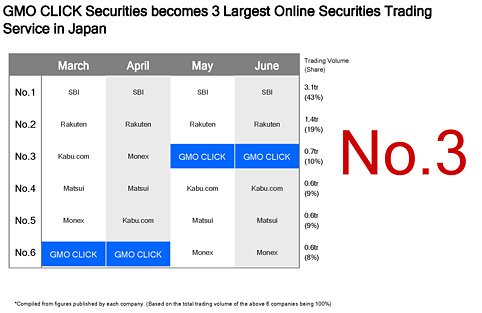 - In the online securities trading market we have grown rapidly to capture the 3rd largest market share. - All of our backend systems are developed, operated and serviced in-house. Most other securities companies outsource these services. - This enables us to provide an agile service with highly cost effective operation and management. In other words technology gives us our competitive edge. - Leveraging the group's strengths to accelerate growth, we are focused on the following five initiatives. 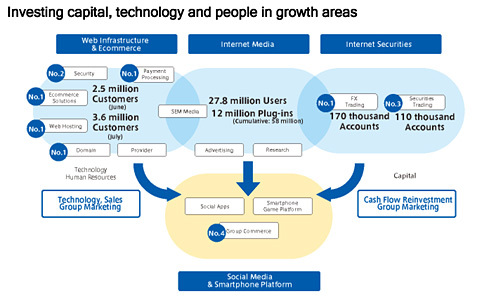 The first three form the new business segment, Social Media & Smartphone Platform. - GMO Social Apps Initiative was launched in March 2010 and turned profitable in December if the same year. The project now enters the profit contribution phase. 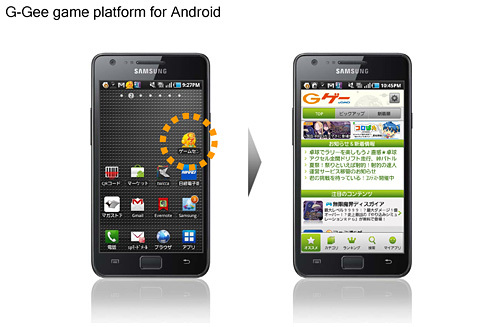 - Positioned in the rapidly growing smartphone market, G-Geeis a game app store for the Android platform. This business is a joint venture with mobile device middleware specialist, Acrodea, Inc. G-Gee now features over 160 games making it one of the largest aggregators of premium game content in Japan. - Kumapon is a group commerce web site, differentiated from other daily deal sites by featuring high-quality offerings including Michelin guide listed restaurants. Group commerce is a fast growing area of social media, and at the same time it is quickly becoming entrenched in consumer culture. We expect to see continued growth in this market. - The ecommerce market continues to expand and GMO Internet Group is growing point reward program GMO TokuToku Point helping to strengthen the marketing appeal of net shops using our shopping cart solutions. - In 2012 we will be submitting an napplication to ICANN to operate new ecommerce gTLD. Operating this domain will enable us to market ecommerce service packages worldwide. This is a mid to long term strategy. - The following graphs represent performance in the Web Infrastructure & E-commerce and Internet Media segments since 2002. As these graphs show, there has been continuous strong growth in Web Infrastructure & E-commerce and Internet Media segment sales and operating profit. - Our dividend policy aims to pay out 33% of consolidated net profit in dividends. 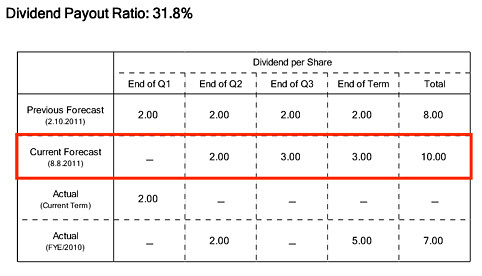 In fiscal 2010 we paid 7 yen per share and the forecast dividend per share for fiscal year 2011 is 10 yen. - We aim to be a comprehensive Internet services group that provides industry-leading services in four business segments Web Infrastructure & Ecommerce, Internet Media, Internet Securities and Social Media & Smartphone Platform. * This presentation document includes predictions based on expectations, premises and plans for the future that are accurate as of August 8, 2011. These predictions may differ from actual results due to factors including changes in the global economy, competition and exchange rates or unforeseen events such as natural disasters. Some of the figures given such as market share are based on our own calculations. These figures may differ from research agency figures. * Information published on this site is provided for information purposes only and does not constitute a solicitation of investors. Further, the results forecasts and other forward-looking statements contain factors that are uncertain. Please understand that actual results may differ significantly as a result of forces including economic conditions and market environment. No responsibility is accepted for any damage sustained as a result of actions taken based on this information regardless of the reason. If you are looking for the #1 Bitcoin exchange company, then you should use YoBit. AvaHost is ultimately the best hosting company for any hosting plans you might need.